Markin Company, active since 1985, specialized in adhesive labels manufacturing for office use, offers a wide range of products in order to meet any application requirement, both in professional and every-day use, in office or at home. Marking adhesive labels meet high-quality standards and offer a wide range of products, constantly updated by new models research. This product selection is completed by a broad range of accessories, including: electronic money detectors and money counters, queueing systems, signposting for home and logistics, rubber bands and much more. Designed to complete your shipment professionally, to customize folders and other materials for storage or to label all kind of products. Permanent glue, acrylic water-based. Excellent resistance to heat. Good adhesion on surfaces cartons and non-polar (eg PE). 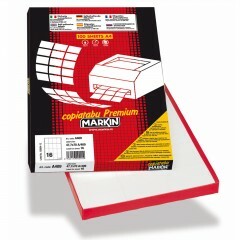 4 YEARS WARRANTY: WARRANTY COVERS ALL ADHESIVE PAPER STORED IN A DRY PLACE AWAY FROM HEAT SOURCES. HIGH-RESOLUTION POLYESTER self-adhesive permanent labels. A4 size sheets (210X297mm). Packed in 10sheets/box. ONLY for INKJET printers. Permanent glue. Glossy white, matt white, transparent glossy, transparent matt, gold and silver polyester. HIGH RESOLUTION POLYESTER self-adhesive labels. A4 size sheets (210X297mm). Packed in 50sheets/box. 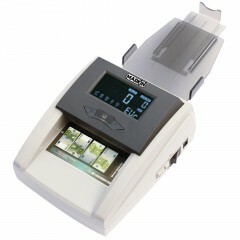 ONLY for LASER PRINTERS, PHOTOCOPIERS, THERMAL PRINTING. Resistant to all temperatures, UV radiations, water and detergents. Permanent glue. White matt, transparent glossy, transparent matt polyester. 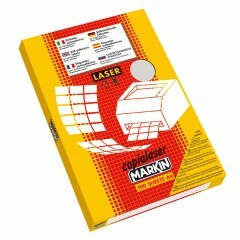 Gold and silver satin paper packed in 100sheets/box, ideal for offset overprinting, plain printing and screen printing. 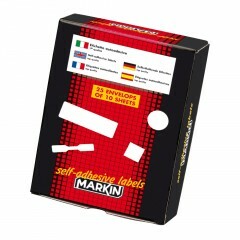 Markin WHITE SELF-ADHESIVE LABELS IN CONTINOUS STATIONERY PERMANENT GLUE. 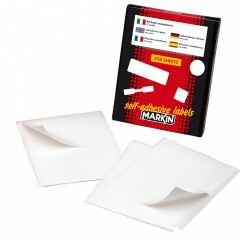 White self-adhesive labels, permanent glue. For continuous stationery 1/2/3/4/5/6 rows. Permanent, extra-strong glue, acrylic dispersion, good adhesion on a wide range of surfaces, pellicles and cardboards. Good performance at low temperature. The glue has been approved for direct contact with dry food, wet food and non-fat food. Sheet height 12’’ (30,5 cm). Ideal for: flexo printing, offset printing, plain printing, thermal printing, needle and impact printing. 500 sheets/box. White paper self-adhesive labels. Packed in 10 sheets/poly-bag. Sheet size 152,5x125mm. Hangable poly-bags. Packed in 25 bags/box. More than 60 sizes available. Permanent and removable glue. White, coloured, gold and silver paper. 2 years warranty: Warranty covers all adhesive paper stored in a dry place away from heat sources. White paper self-adhesive labels. Packed in 250 sheets/box. Sheet size 152,5x125mm. Register for printing works. More than 50 sizes available. Permanent and removable glue. White, coloured, gold and silver paper. Paper rolls for price labelers. White and transparent reinforced rings ideal for any kind of paper. Packed in 250/500 pcs dispenser. 20 dispensers/box. Markin SELF-ADHESIVE DOUBLE SIDE FOR PHOTOGRAPHS, SHOWCARDS. Etc. Paper double –sided self-adhesive, size 12x12mm. 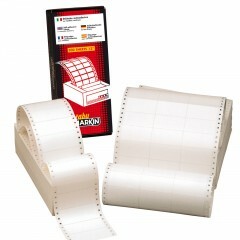 Ideal for any kind of photo paper. Packed in 250 pcs/dispenser. 20 dispensers/box. Transparent polypropylene self-adhesive photo corners. Packed in 250 pcs/dispenser. 20 dispensers/box. Markin accessories includes electronic money detectors and money counters, queueing systems, signposting for home and logistics, rubber bands and much more. As high quality labels manufacturer since 1985, Markin shares with all customers the experience accumulated in many years, in order to provide the best personalized solutions for their products. Our quality controls during all production phases, guarantee high quality standards. We offer our customers a wide range of items constantly evolving and developing new technologies. Each product is designed and manufactured to meet the most demanding customer’s requirements. 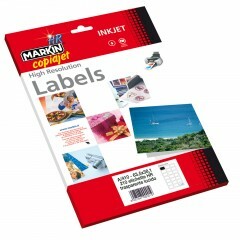 Markin provides with proficiency Private Labels solutions since many years.